As religious cultural communities in the Asia-Pacific region respond to globalisation, some of the more thoughtful elements are discovering that despite their considerable differences, they share a number of perspectives in regard to the environment, economy, consumption, political conduct, community wellbeing and the dignity of the human person. In the view of the two sponsoring organisations, these shared moral values, transcending as they do religious and cultural boundaries, could help to check the negative consequences of globalisation. With this in mind they convened this conference with a view to fostering wide-ranging dialogue involving a large number of groups and individuals from different parts of the Asia-Pacific region. 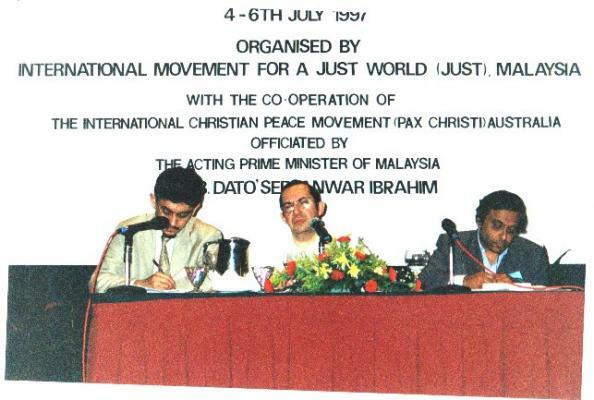 The conference was officially opened by YB Dato' Seri Anwar Ibrahim, the then deputy Prime Minister of Malaysia.